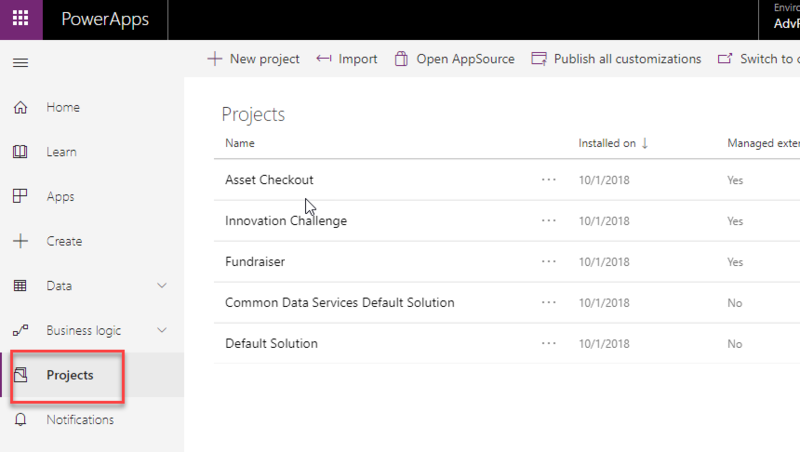 With the latest preview release of the PowerApps portal (check your preview environment, more here) you might happen to notice the link that normally says "Solutions" has been renamed to "Projects". This is nothing more than a label change for now. All the other screens and tools will still say Solutions. There is new functionality to include Canvas Apps and Flows in Solutions coming soon, but otherwise all you knew about Solutions yesterday is the same with Projects now being the new label. Update 11/2/2018 - You might notice that this label has been changed back to Solutions. I'm guessing Microsoft got an earful from the community and reverted the change. I wouldn't be surprised to see the concept of Project come back as they look to enhance solutions in the future.